Order Now and have them, conveniently delivered to your home within 1 to 3 days. Packed in a special container for perishables. One the most exotic is undoubtedly the Hallaca Venezuelan national dish. It combines the indigenous bananas leaves, a rich Spanish filling of beef, chicken, pork, olives and vegetables, with aromatic African spices. The traditional Hallaca is made by extending a plantain leaf, greasing it with a spoonful of colored cooking oil (see Onoto) and spreading a round portion of corn dough (roughly 30 cm), which is then sprinkled with pieces of stewed meat (pork, poultry, beef, lard, crisp pork rind, etc. ), raisins, nuts, pepper, onion, capers, filled olives and occasionally bacon. Afterwards, it is skillfully wrapped in a rectangular fashion, and tied with string in a typical square mesh or wrap-around foil paper, before its cooking in boiling water. Afterwards, it is fished from the pail by means of a fork, unwrapped and served over its own plantain leaves with chicken mayonnaise salad, pan de jamón (ham filled bread) or simply alone. Occasionally, after making a number of hallacas, the remaining portion of ingredients is mixed together in order to obtain a uniform dough. The dough undergoes the same Hallaca wrap and cooking preparation, although typically smaller in size and much fewer in number. The result is called "Bollo" and resemble Mexican tamales. 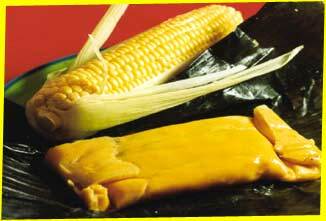 They are offered as a lighter option to the Hallaca, at dinnertime for example. After cooking, Hallacas can be frozen, and in this condition endure several weeks of conservation without flavor changes. Conveniently delivered to your home within 1 to 3 days. Packed in a special container for perishables. Hallacas are South America's version of TAMALES. They consist of ground beef, pork or chicken mixed with other foods such as bacon, olives or raisins, surrounded by a ground-corn dough, wrapped in banana leaves and gently boiled. Hallacas are served as both an appetizer and main dish. Latin-American culture is a mixture of indigenous, European and African influences. The strong contrast of flavor and color in the food reflect this. One the most exotic is undoubtedly the Hallaca, Venezuelan national dish. It combines the indigenous bananas leaves, a rich Spanish filling of beef, chicken, pork, olives and vegetables, with aromatic African spices. Its origin is unclear. It could have arisen from the Spanish colonists homesickness for their tasty and elaborate meals. On this view we might relate the Hallaca to the Empanada Gallega. Another theory attributes the Hallaca to Venezuelan rich ranches where servants and slaves used the leftovers from the tables of their masters, whose meals had a distinctly European character. Adapting these eclectic ingredients to their African and indigenous tastes, the slaves created one of the most creative, flavorful and richly seasoned Latin-American dish. Download our partial Hors D' Oeuvres Menu Click here to download it!